Hickam Air Force Base unveiled the Air Force's first hydrogen production and refueling stationon Nov. 2 Matthew Morse held the hose that transfers the hydrogen under pressure from the storage tanks to the fuel-cell electric bus. THE STATE and the Air Force have passed a milestone in helping the islands to break dependence on imported petroleum with the development and operation of Hawaii's first hydrogen generation and dispersing station. "We're not quite there where there will be a hydrogen fueling station on every street corner like there are gas stations today," said Tom Quinn, director of the Hawaii Center for Advanced Transportation Technologies, "but we're getting there." Quinn was referring to a research and development project that is part of a multi-phased alternative fuel vehicle development program that was started five years ago at Hickam Air Force Base. Using hydrogen fuel cells and a battery hybrid system, Quinn said, results in zero emissions. "The challenge has always been to capture hydrogen," Quinn added, "since it doesn't exist in a pure form and has to be extracted from something like water." In September 2001, with congressional appropriations sought by Sen. Daniel Inouye, the state entered into a partnership with Advanced Power Technology Development Corp. at Robins Air Force Base in Georgia to establish a national demonstration center at Hickam. Quinn, whose office is a division of the state High Technology Development Corp. in charge of Hawaii's commercial high technology industry, said the project is to help the Air Force develop and test the latest fuel-efficient vehicles and equipment and break its dependence on imported petroleum energy. 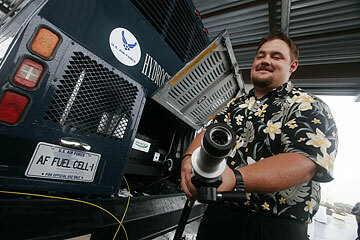 In February 2004, the state and the Air Force unveiled the state's first fuel-cell vehicle. The 30-foot shuttle bus cost $1 million, was the first of its kind and is used at Hickam to shuttle 24 passengers. Quinn said the shuttle bus carries a 10-kilogram storage bottle that gives the bus about a 100-mile range. That was followed by a van and a tractor used by Hawaii Air National Guard ground crews to tow aircraft. This month, Hickam officials dedicated the state's first hydrogen generation and dispersing station. The $1.5 million system is the first portable and deployable hydrogen vehicle production and fueling station in the Air Force and the Department of Defense. Quinn said the hydrogen production plant helps the Air Force meet one of its "greatest challenges" -- getting fuel to its forward deployed troops and equipment. » Hydrogen fuel processor that utilizes two electrolyzers that can produce 35 to 50 kilograms of hydrogen a day from water. » Hydrogen pressure management system that compresses hydrogen up to 5,000 pounds per square inch. » Hydrogen pressure storage that uses nine tanks to store the hydrogen. Mark Schultz, operations manager, said two additional modules are used to control power and the other water for electrolysis. Quinn said the hydrogen production system is run either by a 250-kilowatt diesel portable generator that is used by all military services or by ground power stations. Additional hydrogen fuel cell vehicles planned for Hickam include light cars, small aircraft flight line maintenance trucks, towing vehicles and flight line sweepers. Schultz said hydrogen generation technology has been around for 62 years and has been used by the National Aeronautics and Space Administration, using hydrogen to run the fuel cells on the space station and the oxygen for its life-support systems. At Hickam, Schultz said the station "makes just enough hydrogen used by the bus each day," but production can be increased to meet future demands. Quinn said the Hickam demonstration project can help with civilian operations, such as commercial bus fleet operations. Quinn said there are commercial bus projects being tested in California and New York. He added that U.S. Department of Transportation has a five year fuel cell development project valued at $49 million to develop a 40-foot standard transit bus. The Hickam hydrogen-powered bus and the hydrogen generation and refueling station is "serving as a model for the rest of the Air Force and the Department of Defense," Quinn added. "It's nice that Hawaii has that lead."